The Hollywood Museum is the preeminent collection of historic Hollywood movie memorabilia on display to the public. It is one of the Top Hollywood Attractions and one of my favorite Movie and TV Industry Attractions. While there are studio-specific exhibits at Universal Studios Hollywood, Warner Bros and Paramount Studios, the Hollywood Museum's collection crosses brand lines and includes artifacts from long-defunct studios. Its exhibits cover four floors and span the history of the movie industry from its inception to recent hits, often showcasing specific personalities or movies in temporary exhibits. In recent years more TV costumes, set pieces and props have been added to the collection. Time Needed: Allow 2 hours or more, depending on your interest. Admission: fee required, even for kids in strollers. Note: Not really appropriate for young kids. Once upon a time, the pink and green Hollywood regency Art Deco building near the corner of Hollywood and Highland was the Max Factor makeup factory and studio. This is where Max Factor himself designed the look and products for the grand dames of Hollywood from hair color to foundation and lip color. Today its 35,000 square feet house the Hollywood Museum. The Hollywood Museum preserves Max Factor's first-floor make-up studios intact as part of the exhibit. Factor had each of four rooms painted in shades to complement the complexion and hair of the actresses being made up there. Each includes photos of the stars made up there as well as products used on them. The pale green studio "For Redheads Only" is also called "The Lucy Room" after Lucille Ball, whose natural brunette tresses were dyed red in this room. The blue room "For Blonds Only" saw the transformation of stars like Marilyn Monroe, Mae West, Jean Harlow, June Allyson and Ginger Rogers. The studio "For Brownettes Only" is painted peach to complement the coloring of actresses like Judy Garland, Lauren Bacall and Donna Reed. Brunettes like Elizabeth Taylor, Joan Crawford and Rosalind Russell were flattered by their reflection against walls painted pale pink. Try checking out your reflection in the different colored rooms. It really does make a difference! On the first floor, beyond the Max Factor displays, Cary Grant's Rolls Royce shares space with a spacecraft and costumes from Planet of the Apes, Star Wars and Jurassic Park. 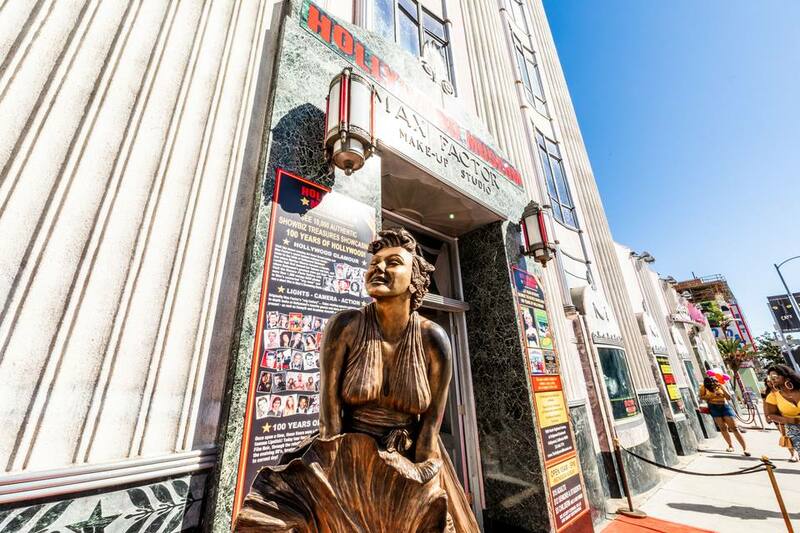 The museum has the largest single collection of Marilyn Monroe memorabilia anywhere, and you'll find it on the second floor next to elaborate costumes from Mae West and other Hollywood divas. Highlights include a thorough history of Bob Hope's TV and movie career, including one of his Emmy Awards, through Elvis's bathrobe, and Sylvester Stallone's Rocky boxing gloves, as well as costumes worn by Michael Jackson, Leonardo DiCaprio, Tom Cruise, Nicole Kidman, Beyoncé, Miley Cyrus, George Clooney, Jennifer Lopez, Brad Pitt and Angelina Jolie. There are exhibits from films like Star Trek, Transformers, Moulin Rouge, High School Musical and Harry Potter, and TV shows such as I Love Lucy, Baywatch, Glee and The Sopranos. I think my favorite thing in the whole museum is Roddy McDowall's Powder Room, from his front hall, re-created in its entirety with one glass wall and the other three dark green walls adorned with his personal souvenir photos of celebrity friends. In addition to memorabilia from specific movies, TV shows and actors, there is a technology exhibit that traces the history of the film industry from silent film cameras through the talkies to the digital age. The Basement level is dedicated to horror films from early Boris Karloff to Hannibal Lecter's cell from Silence of the Lambs, costumes from Nightmare on Elm Street and props and costumes from Dexter and the Walking Dead interspersed with extensive exhibits from Stargate, Master and Commander, The Gangs of New York and Harry Potter. There's also a nice tribute to Elizabeth Taylor's Cleopatra including costume, wig and set pieces. Information was accurate at the time of publication. Check the website for the most current information.